Hi everyone, it’s Amy from Ms. Toody Goo Shoes, and I’m back here at Claire’s for the first Home and Garden post of the new year. You know how you get it in your head sometimes that you just have to have something? This happens to me all the time. It can be a pair of shoes, a certain color nail polish, or a particular food I’m craving. Or, as was the case recently…a tray. One night when I had insomnia, I was browsing Pinterest at about 3:00am (do you ever do that? ), and noticed lots of pretty vignettes, many of which used trays to tie things together. My mind was spinning…forget about sleeping…I was dreaming up tray arrangements till the wee hours. The next morning, after three cups of coffee and some toothpicks to prop my eyelids open, I went to Home Goods in pursuit of the perfect tray. In my mind’s eye, my tray shouldn’t be too fancy, nor too rustic; not too colorful, and not too blah. 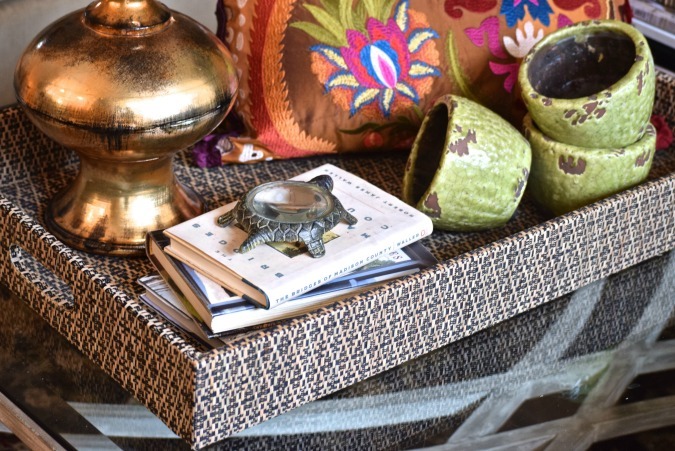 It had to look as good on the dining room table as it would on a picnic table…or an ottoman…or the bed…or anywhere. By george, I think I found it. And it was only $20. 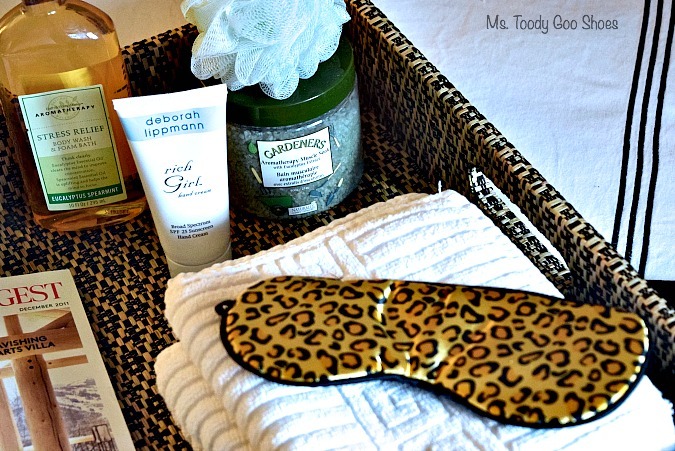 Since then, I’ve been going a little tray “cray-cray” creating vignettes. I think this could turn into an obsession. The possibilities are endless! 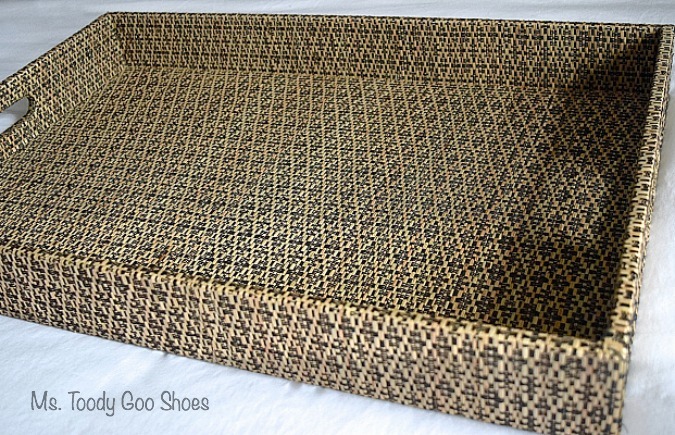 In the family room, my tray-scape has lots of texture. I combined a brightly colored embroidered pillow, with some chipped pottery (these little pots show up in many of my arrangements, like here), some books, and a tall, shiny thingamajig (what in the world would you call that, anyway?). Isn’t this a nice way to welcome a guest? 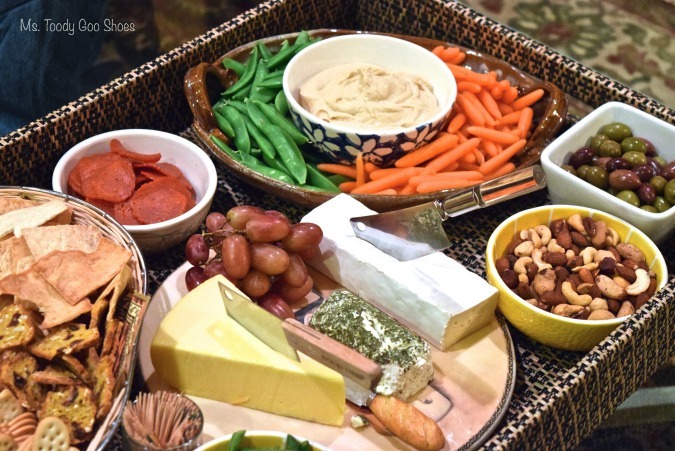 I gathered up a few things they might need, which look much more inviting on a tray. I just hope she doesn’t spill the water from the flowers on the bed. 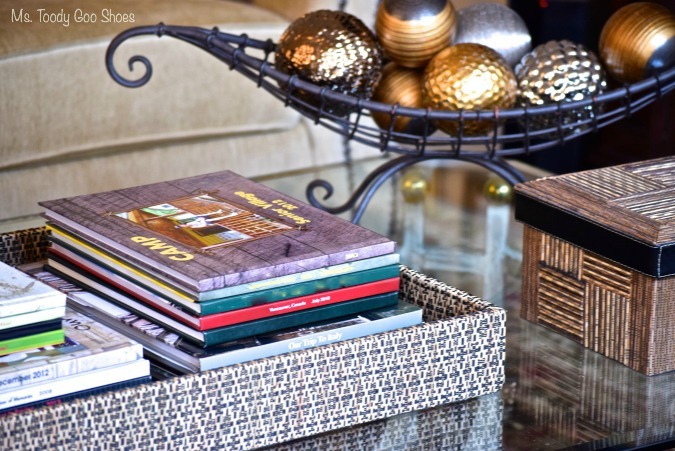 Most of the time, the tray sits on the coffee table holding my stacks of photo books. It keeps them more tidy that way. Of course, there are times when a tray is just a tray, used to transport food from here to there. It looks better than a bunch of random dishes on the coffee table, and after everyone devours the food, I can simply carry the whole thing into the kitchen. 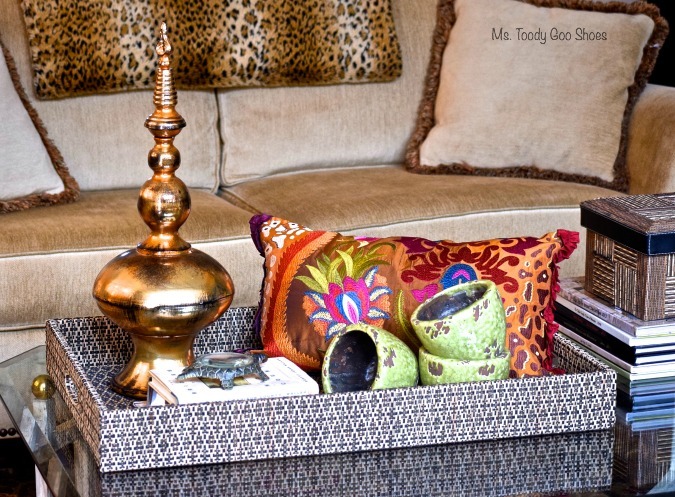 Remember I mentioned using themes when creating tray vignettes? 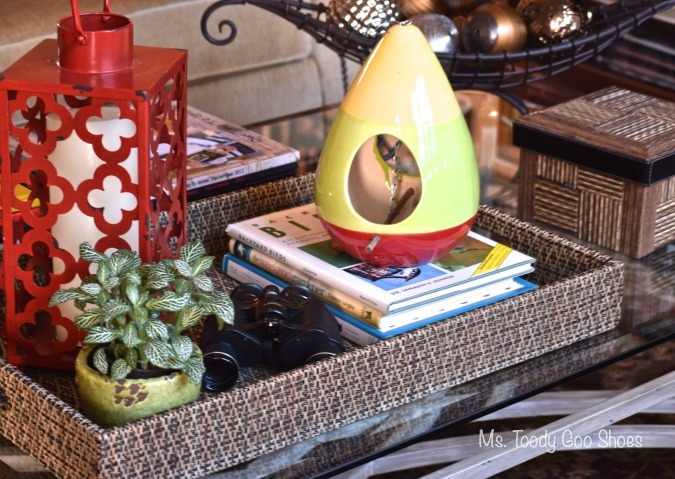 This one is for the birds…bird books, bird house, binoculars..(there’s that lantern again, and green pot). I just “winged” this one, heh heh. Everything looks better when it sits on a tray, don’t you agree? Dear Amy, These all look inviting and warm. Of course, the one with the snacks looks extra good. lol. Great vignettes! I haven’t tried trays yet, but have used vintage vanity mirrors and picnic baskets for the same idea. Love how versatile your one tray is! 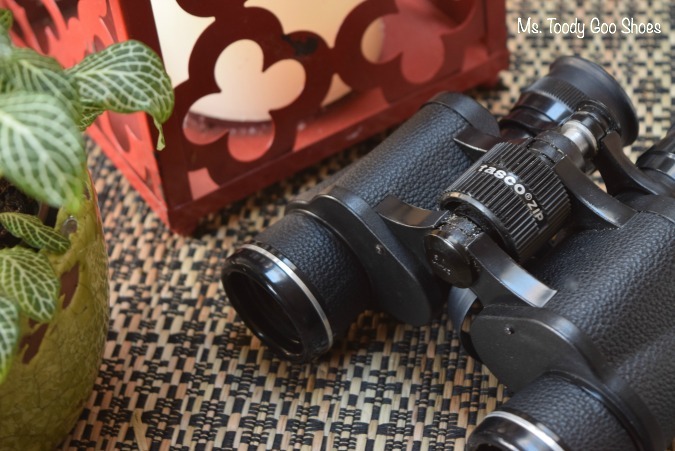 Popping over from Amy’s blog, and I too, get ideas in my head that I become obsessed about! I love the tray you chose and all your tray ideas. Happy New Year and keep up the good work! 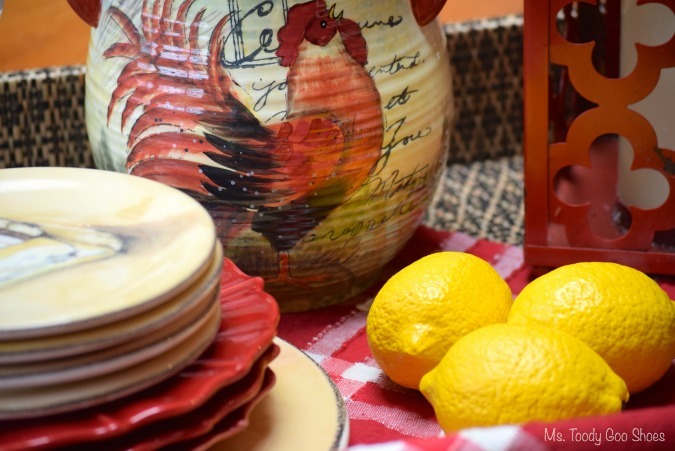 You picked a beautiful tray and have done the most wonderful vignettes with it!!! Well done. 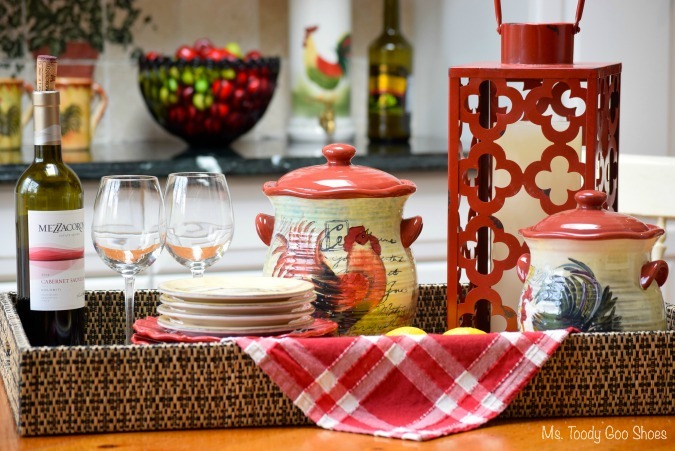 You certainly got your $20 worth from that tray – every vignette is gorgeous! All I have on my trays are the tv remote, coasters, and a box of tissues. I think I need to reconsider my tray art. Thanks for the ideas!! Excellent post! Thank you! 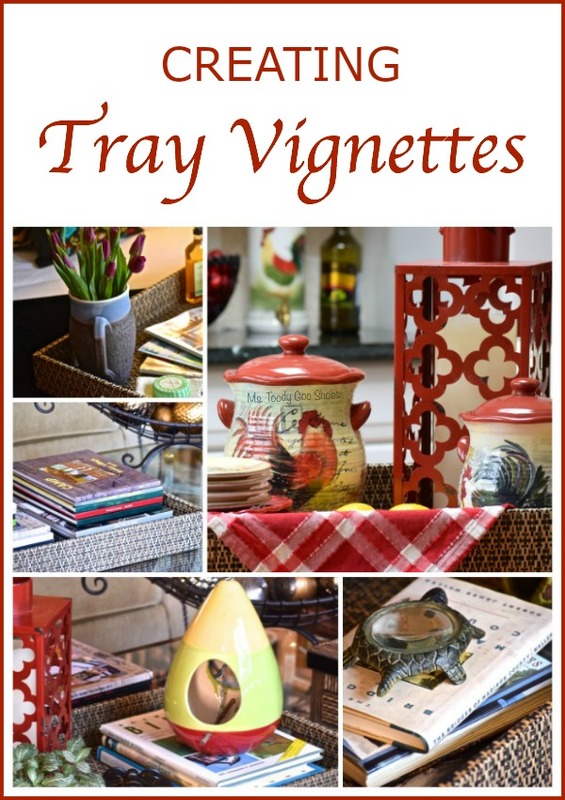 I can’t wait to set up some tray vignettes now. I have a tray-shaped light reed type open basket that I’ve been wondering what to do with. Now I realize I’ll spray paint it a neutral suitable for my mostly cottage-y decor, and begin using it for various vignettes in my little home. You have inspired me, Amy! Thank you again!